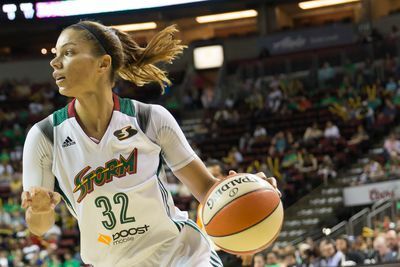 In front of a sellout crowd, Seattle Storm guard/forward Alysha Clark had the best game of her career. Her performance helped the Storm blowout the Atlanta Dream. The game, which was played in front of an announced sellout crowd of 9,686, was the annual “homecoming” for Shoni Schimmel. Schimmel’s popularity among Native Americans has made her one of the most recognizable names in the WNBA, and nowhere is her popularity on greater display than in her annual trip to the Emerald City. Fans from as far away as Montana made the journey to Seattle just to watch her play. Some fans were lined up on the steps of Key Arena close to five hours before tip-off. Last year, the contingent of Schimmel fans actually outnumbered Storm fans, turning the Storm’s legendary home court advantage against them. This time, with Schimmel’s skills having seemingly regressed, the fans in attendance all gave their full support to the home team while still cheering for Schimmel herself. Seattle got off to a scorching start, outscoring the Dream 27-16 in the first quarter. By halftime, the Storm had torched the bewildered Dream for 48 first-half points and took a 48-33 lead to the locker room. The third quarter again saw the Storm outplay the Dream. Winning the quarter 20-18 and increasing their lead to 17. The second-year guard, who has been voted an all-star starter for the second straight season, recorded all eight of her points along with two of her three rebounds in the period. She also added one of her three assists and managed to block a jump shot attempt from Seattle rookie Kaleena Mosqueda-Lewis. Despite her late game play, Atlanta was overwhelmed by the Storms intense defense and were unable to get closer than 12 during the final quarter. Leading the onslaught for the Storm were Alysha Clark and Ramu Tokashiki, whom both scored 14. For Clark, that is a career high. Crystal Langhorne added 10 points of her own along with a game-high nine rebounds. Atlanta was led by the game-high 16 points from Angel McCoughtry and also received double-digit contributions from Tiffany Hayes (12) and Erica Wheeler (11). With the win, Seattle improves to 5-12 while Atlanta falls to 7-9 on the season.